Each one's a QUART, it has no doors. Each room has two windows, dear. Each one's a CUP--I hope that's clear. That's a HALF GALLON and will make you laugh. The kids loved it. They can color the house. They can make it out of construction paper and glue the poem on the back. 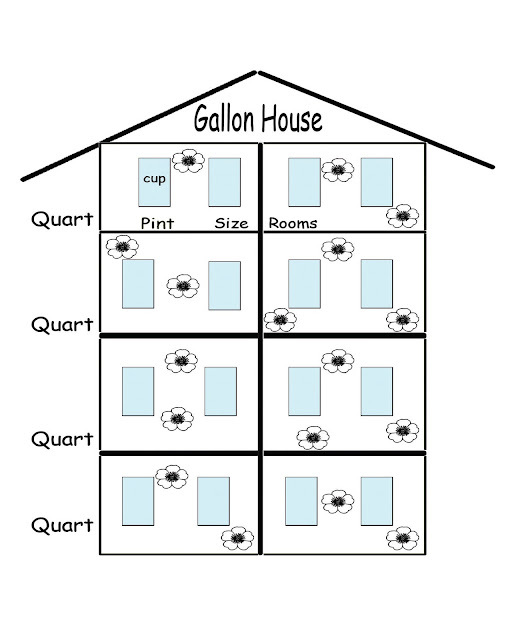 They can use it to answer measurement questions such as "How many cups (windows) are in a gallon?" "How many quarts (floors) are there?" "How many pints are in a quart, a half gallon, a gallon?" You get it.